In my travels recently my partner and myself found the road would lead to Perth WA, so we did a quick search and found there was a Yuishinkai dojo there! So Gi’s and weapons got packed and off we headed to the west coast. 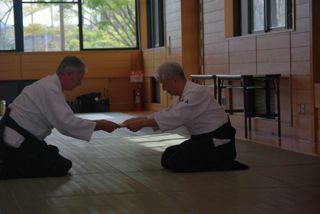 Before heading over we made contact with Sensei David Mathews who wrote a very encouraging email and very detailed instructions on how to find the dojo. So on a Wednesday night we left Perth to head down to Port Kennedy ( the dojo location). when we arrived we found a dojo full of life and packed with children training on the tatami and Sensei Mathews leading a bunch of very keen young Aikidoka. We were greeted and welcomed in by other club members. The dojo was also a testament to Sensei Mathews dedication as the set up was excellent & had a lot of effort put into it. We eventually found ourselves on the mat and I realised another amazing thing about the warm-ups and Aiki-tiso in Yuishinkai, in that familiarity dose help maintain a relaxed state of mind and body- doing these familiar exercises amongst other people also doing the same exercises you have only just meet, dose help to put one at ease, here we had travelled over three and half thousand Kilometres and we are all doing the same thing. Down to training and I found every one eager to get their hands on you, and enter into a very good understanding of the Uke/Nage relationship, and look at developing their own understanding of this, I also was nicely challenged, with a great rolling exercise that warrants some more exploration- rolling over and as going over picking up the Jo as level one and then level 2 was a nice exercise of changing distance where as you walk toward the Jo someone rolls it toward you..then as you get close to the Jo you roll over and collect it. Not impossible on first attempt but I did find myself thinking way too much during this exercise. What we discovered was a great bunch of fellow Aikidoka in realistically one of the most remote locations in the country getting on with and enjoying their training, while also dedicated to the teachings, style and the motto of Master Murayama- it was great to travel so far and discover something new, but still feel welcome and have a certain sense of family, the only real problem was we only had one chance to visit and the lesson was great, so it felt like no time had passed before it was over. Big thanks to Sensei David Mathews and the rest of the Port Kennedy dojo for making Susan and myself most welcome, it’s defiantly a great part of aikido that you can pack your Gi and travel, keep training and also meet great people. Win win win!